By Jake Rocheleau in Social Media. Updated on April 9, 2018 . The largest social media sites have practically taken over the world, with Facebook currently pushing towards 2 billion users worldwide. One of their many advancements in technology is the Open Graph or OG protocol. These OG tags have become the norm on other social networks such as Pinterest and LinkedIn, so having them on your site can be tremendously beneficial. And now, with the Mega Tags web app, the entire process can be automated, without writing a single line of code. By default, there are two different “types” of social meta tags: Open Graph covers most networks but Twitter has their own called Twitter Cards. 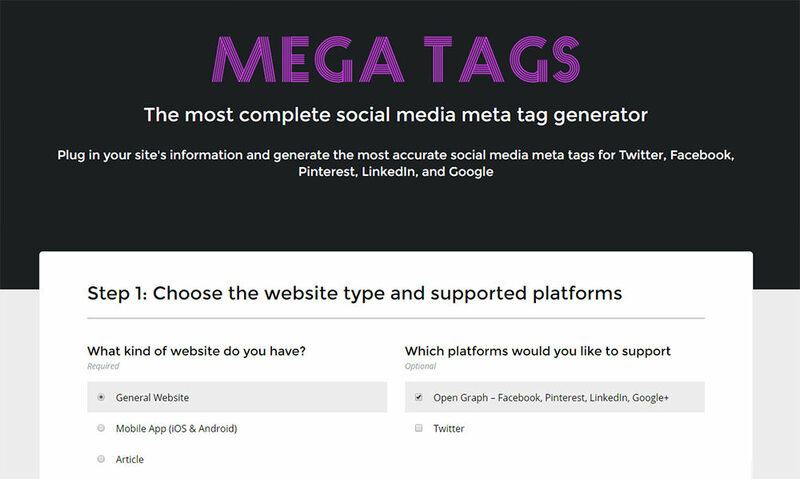 These extra tags share information with social networks, so you can customize how your links appear when shared on these sites. Networks, such as Facebook, have their own algorithms for pulling a page’s title, description, and thumbnail. This is useful when people share links on FB and other social networks. With these meta tags in your header, you can tell Facebook, Pinterest, Google+, and others exactly how to display your content. Some websites might even have a Facebook page which can be included in the Open Graph content. This offers even more control where Facebook can pick & choose which data they want to present. This free web app can do it all for you by default. Just enter your page URL, the title/description, and include a thumbnail image if needed. You might also dig into the optional settings if you want. From there, you can copy/paste the meta tags into your header and voila! A fully compatible Open Graph page ready for sharing. The site even has validators with which you can check to make sure your page is being validated properly on all your chosen networks. And, you have access to a full reference page with a table of all OG properties and expected values. Some of these properties may change over time or new features may be added to the Open Graph protocol. But, so many sites already use these features, so you’d be crazy not to! To get started, just visit the web app, add your site info, and copy/paste the code into your page header. You’ll notice an immediate difference whenever people share your links on social sites around the web.